Sarabel Santos and her work "El Abrazo"
For many years now we were sure that art and science were poles apart, two categories belonging to two different tree branches. Is not until recently when artists and scientists all around the world have reclaimed that, probably, art and science are different branches but from the same tree and thereby they are complimentary. This is the only way to comprehend the artistic work of Sarabel Santos Negrón, a Puerto Rican artist that started her early studies at the Central School of Visual Arts and that presently holds a bachelor in painting with a degree in history of art from the University of Puerto Rico, besides a master in art with specialization in museology from Caribbean University at Bayamón. As Sarabel herself highlights, her work ranges between the figuration and abstraction of nature and the human shape; thus resulting in an artistic work with profound scientific connotations. After two conversations with Sarabel and a visit to her exposition at the Arsenal Museum in la Puntilla, Old San Juan, fascinating conclusions arise, not just on Sarabel's work but about the art of painting in general. Art, whose complexity sometimes seemed to be the accomplishment of total liberty from its creator, can hide a very structured implementation process. Moreover, is evident that the artistic product sometimes is reached breaking through diverse scientific realms such as mathematics, biology, and even psychology. About Sarabel Santos highlights a deep passion for nature that dates back from her childhood. She grew up in the countryside and lived there until her youth where she herself express that discovered "to contemplate the sunsets, listen to the trees, and to feel hugged by nature". Today, part of her work arises from the investigation of many natural systems and its complexity. Dendrology for instance, which is the branch of botanic to study trees and bushes, has inspired some of the most important work of Sarabel. 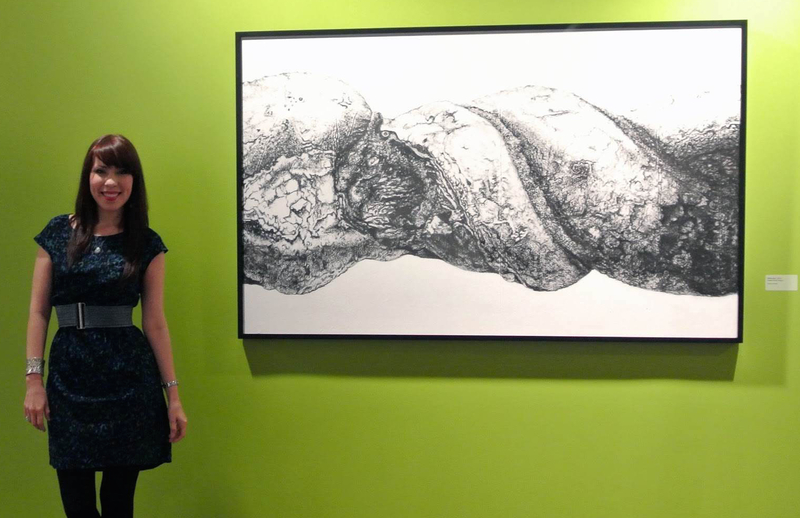 "This particular interest in the morphologic and anatomical changes of nature lead to develop a visual discourse where the graphic medium intertwines with the plastic surface", says Sarabel at the time she contemplates El Abrazo (The Hug) painted in charcoal on canvas and exhibited at the Arsenal Museum in Old San Juan. No color. Totally in black and white to highlight the essence of every detail of natural form. Thus, she explores the idea in which we "coexist with nature and that is discovered when putting attention to details", says the artist, "details that usually are unnoticeable". Her aim is to transmit her own sensibility for nature to those who meet her art. "Art stimulates that thing that many people don't know, that they don't recognize", concludes Sarabel. Her work, that evidently integrates the "accidental" as part of the expression, has a rigorous and mathematical formal code. Sarabel Santos know about the Fibonacci sequence, about proportions, movement, patterns and geometric rhythms, and consider them all before the beginning of each piece of art. Thus, the structure of her plastic work relies hidden. "Each frame is proportioned, the canvas must be designed too", she says. Taking advantage of mathematical proportions between figure and ground, Sarabel manipulates from the approach of a person to the painting, to the movement of the eye through the drawing. As any architect that has to design the way people moves in a building, Sarabel designs the order her painting must be explored. According to her, this is very typical among great artists such as José Campeche, Francisco Goya, and Lorenzo Bernini, whose art emerges from the mastering of this technical aspects. Finally, is not actually absurd to conclude that Sarabel's art is a mirror seeking to reflect the spirit of its creator. Thereby, seems that every artist is wondered by the mysteries of the universe, but nothing fascinates them the most than the complexity of their own spirit. This Puerto Rican artist shares about this that "painting is a necessity to empty the mind and heart". Tríptico de la Vida (Triptych of Life), another of Sarabel outstanding work, is much more than a simple painting wanting to communicate a message, but seems to be also the artist relief to her own concerns about the human mortality, something that she has experienced closely. Thus, Sarabel's work becomes an auto-portrait of her own condition, an image of the deepest psychology of her humanity. How much do we see when contemplating a work of art? How much science precedes the image, the expression and the message? Whom do we see, the artist or us? In the artwork by Sarabel Santos Negrón coexists this multiplicity of dimensions where converges the technique and the expression. Just a little of reflection to have for sure that science lies at the beginning of each art, while art lies at the end of all sciences.